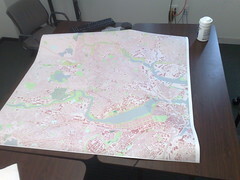 In prep for the OpenStreetMap Mapping Party this Saturday and Sunday in Somerville, I was working on printing a big map to bring with me. A friend at the Media Lab was gracious enough to help me out. Using Mapnik, it was trivial to produce a large — 29750 x 29750 pixel — PNG image. This was designed to fill up the 49.5″ by 49.5″ printer space at 600 dpi. Thanks to a suggestion from Norman Vine, I was able to use the ossim image copy program (icp) to convert this giant tiff to a tiled tiff which gdal could easily read: icp tiff_tiled -w 256 image2.out.tiff image.icp.tiff. Once I had done this, I recompressed the tiff using LZW compression with GDAL: gdal_translate -co COMPRESS=LZW image.icp.tiff image.lzw.tiff, and was able to upload the 3GB image to the printer. All in all, took a bit more than I was expecting, but I’ve got a 4ft by 4ft map to bring to the mapping party this weekend. In the process, I also got to wanting magnification in Mapnik… which is amusing since just 24 hours before, I’d read a thread on the MapServer list and couldn’t imagine for the life of me why such a thing mattered. Looking forward to showing the map off to local OSMers at the mapping party! You are currently browsing the Technical Ramblings weblog archives for February, 2009.